Whether it was a fix-and-flip you fell in love with or an old home that you moved into and restored with your own bare hands, the truth of the matter is, you don’t want to leave your old house behind, even if you want to move to a new location. Of course, moving the house itself to a new location is always an option, but if your home is old enough, you may have to check in with regulations and rules governing historical home relocation in your area to ensure you’re getting it done right. Regardless, there are several things which these types of rules have in common that you should consider closely before even attempting the process. First and foremost, consider the surrounding neighborhood. If the removal of the home in question is somehow going to damage the value or appearance of its neighborhood, the odds are that you won’t be able to move the house. The area you’re moving the house to will also be taken into consideration. The new location must have the adequate space, support and other details to keep the home in good condition during a historical home relocation. Considerations may include the bulk and materials of other homes in the new neighborhood in many cases as well. If you are able to move your house and manage to work your way through all that red tape successfully, there are a few things you’ll want to do to make your transition as smooth as possible. The first thing you’ll want to do is to record accurate measurements of your home’s height, width, length and other dimensions before the move, and the dimensions of each individual room if possible. This is to help ensure the integrity of the home’s layout isn’t compromised during the move. 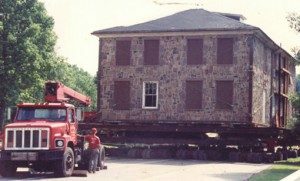 Undergoing a historical home relocation isn’t a simple or easy matters by any means, but sometimes it’s the only way to have your home exactly where you want it.